The tectonic history of the Central Asian mountains is given in Zonenshain et al. (1990). 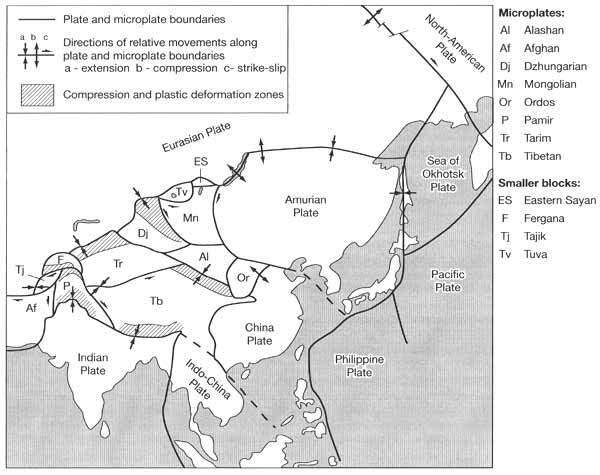 The contemporary tectonic pattern of the Central Asian mountains as well as their seismicity originate from the continental collision between India and Eurasia (Figure 14.1). The initial collision occurred in the late Cretaceous, replacing simple subduction of the Tethys oceanic lithosphere below the Eurasian Plate (Molnar and Tapponier, 1975). The most intensive stage of collision manifested itself as the Alpine orogenic epoch which began in the Miocene. The Alpine folding was extensive both in terms of duration and the complexity of tectonic movements and, although it occurred everywhere, its manifestation varied regionally. In the northern chains, the Alpine folding was relatively weak but its intensity increased southwards, reaching its maximum in the Pamirs. The Pamirs and Kopetdagh were formed as a result of the latest collision. By contrast, the Tien-Shan and mountains of Kazakhstan are of an older age: they were formed by the convergence and collision of the Siberian continent with the ancient massifs located south of the continent; eroded, being transformed into a peneplain of the Kazakh Knolls type, and rejuvenated in the Cenozoic. The formation of a peneplain and subsequent uplift had a strong effect on the modern topography of the Tien-Shan, Dzhungarsky Alatau, Saur, and Tarbagatay which is characterized by the occurrence of high elevation plateau-like and inclined ancient denuded surfaces. The central (inner) Tien-Shan itself has an average height of 3100 m and is encircled by the Terskey-Alatau, Kokshaal-Tau, and Fergana Ridges with comparatively small relative elevations. Denuded surfaces often form high elevated valleys covered by glacial and alluvial deposits termed in Turkic languages syrt.] Because of their ubiquitous presence the central Tien-Shan is often referred to as the syrt Tien-Shan. Typical of the Dzhungarsky Alatau, Saur, and Tarbagatay are plateaux which occur at different heights, thereby giving the slopes a step-like appearance. Such plateaux, which are ancient structures uplifted in the Neogene-Quaternary, occupy between 30 per cent and 40 per cent of the whole territory of these mountains. 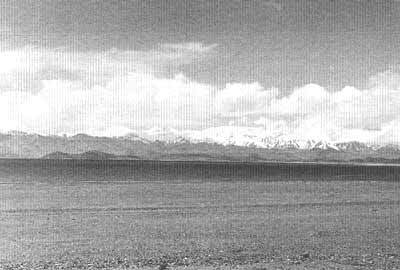 The structure of the Pamirs results directly from the collision between India and Eurasia and in this respect, the Pamirs are similar to the Himalayas. At present, in the area of the Pamirs the Indian Plate moves at a rate of 4.4 cm a-1 relative to Eurasia. While some of this movement is taken up by overthrusting in the Pemjab Himalayas, the other half creates convergence between the Pamirs and Tien-Shan (Zonenshain et al, 1990). Geodetic measurements reveal a rate of convergence of 1.5-2.5 cm a-1 that makes it an area of extremely high seismic activity (Hamburger et al., 1992; 1993). The Gissar-Alay deep fault, which extends along the southern slope of the Gissar Ridge and further east along the valleys of the rivers Surkhob and Kyzylsu, mark a boundary between the two structures and is an area of particularly devastating earthquakes. The territory located south of the Gissar-Alay system is tectonically inhomogeneous and includes three major zones: the Tajik depression which represents a deeply submerged Mesozoic-Cenozoic sedimentary basin, the western Pamir (often considered together with the Zaalaysky Ridge), and eastern Pamir which represents an active continental margin. Although both western and eastern Pamir are characterized by great absolute heights, their topography is very different. The fast and irregular upheaval and the continuing subsidence of the large depressions (i.e., the Fergana valley and Tajik depression) predetermines a youthful character of relief in the western Pamir which is characterized by large relative elevations and narrow valleys with steep slopes. The highest summit in the FSU, the Peak of Communism (also known as Garmo) (7482 m) and the largest alpine (Fedchenko) glacier are located in the western Pamir on the junction of the Peter the First and Academy of Sciences Ridges. The eastern Pamir2 has the character of a highly elevated plateau (Plate 16.1). The ancient relief has survived here in the form of vast flat valleys elevated to the height of 3500-4500 m on which permafrost develops. Locally, these valleys are called pamirs (meaning 'roof of the world'), the term which has given the region its name (Svarichevskaya, 1965). Relative elevations are often comparatively small, about 1-1.5 km. Within Turkmenistan lies the northern periphery of the Kopetdagh mountains which continue into Iran. The mountains are regarded as a fold chain that originated on the former passive margin due to the late Cenozoic motion of the Iranian block relative to Eurasia (Zonenshain et al., 1990). The Kopetdagh is not a single ridge but a system of mountainous chains (whose peaks do not exceed 3000 m) separated by the narrow valleys with an west-east orientation.